The setting is 1920's Italy, just after World War I, and the skies are ruled by daring sea-plane pilots of all sorts -- soldiers, bounty hunters, and pirates, all who after a hard day's work convene at Gina's island cafe to kick back, relax, and hear the lovely Gina sing. An unwritten truce between all men, no matter what vocation, is always in effect at Gina's. The bravest pilot known at Gina's cafe, however, isn't even really a man at all. He's Porco Rosso, a once-human pilot with the heart of a lion, the cunning of a wolf, and the head of a pig. Porco is envied and hated by many, partially for his unsurpassed skill in flying, and partially for his friendship with Gina, and partially for his apparent apathy towards "humans' politics" even as the fascists are establishing their power. Such popularity could prove dangerous as Porco suddenly finds himself beset by pirates seeking revenge, fascists seeking his blood, and a jealous suitor seeking what he loves most in life. 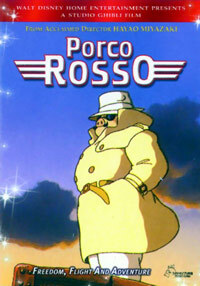 Porco Rosso could be the most underrated Miyazaki-directed anime so far. There's good adventure to be had, of course, but at its heart Porco Rosso views less like a good action movie and more like a light psychological study of the concepts of loyalty, "goodness", and love. Being a Miyazaki-directed film, the artwork and animation are of course well above par and a pleasure to watch, with the same amount of detail that we've all come to expect from good ol' Hayao. Do you like aircraft? Good -- so does Miyazaki, and it shows. All the technical aspects of this film are more than satisfactory, with an appropriate if understated soundtrack that nicely moves the differing moods of the film along. It's in the area of plot, though, where the film departs from Miyazaki's normal mode of operation. It's actually not quite fair to try and create a plot summary of Porco Rosso, because the plot really isn't the point of the movie. The pace and tone of the story is quite laid-back (even compared to Totoro), and even the main conflicts adopt a certain casualness might make the viewer blink and wonder if he/she missed something. Fortunately, while Porco Rosso might not feature the most gripping action sequences, it does feature a great cast of characters. You can't have a psychological study without interesting cases to study, and PR's got 'em. The jaded and world-weary Porco, the trusting and hopeful Gina, the world-wise Curtis, and the innocent and bright-eyed Fio -- each character contributes to Miyazaki's overall picture of people and life during post-WWI, with all the goods and bads. This is one anime that will probably become better and fuller with each subsequent viewing. So, if you don't mind not getting the standard serving of mind and eye-candy most anime dutifully dole out, and wish for something to chew on instead, Porco Rosso might pleasantly surprise you.